A. Bernard Knapp is Emeritus Professor of Mediterranean Archaeology, Department of Archaeology, Glasgow University, now affiliated with the Cyprus American Archaeological Research Institute in Nicosia, Cyprus. His focal area of research is the prehistoric eastern Mediterranean, in particular Cyprus, with specific interests in island archaeology, social identity and gender, and archaeologies of landscape. His most recent books are Prehistoric and Protohistoric Cyprus: Identity, Insularity and Connectivity (Oxford Oxford University Press, 2008), The Archaeology of Cyprus: From Earliest Prehistory through the Bronze Age (Cambridge University Press, 2013), and co-edited with Peter van Dommelen, The Cambridge Prehistory of the Bronze-Iron Age Mediterranean (Cambridge University Press, 2014). John F. Cherry is Professor of Archaeology, Classics and Anthropology in the Joukowsky Institute for Archaeology and the Ancient World at Brown University. Research and teaching interests include Aegean prehistory, state formation, island archaeology, lithics, and archaeological ethics. His most recent book is Prehistorians Round the Pond: Reflections on Aegean Prehistory as a Discipline (Ann Arbor, 2005), co-edited with Despina Margomenou and Lauren Talalay. 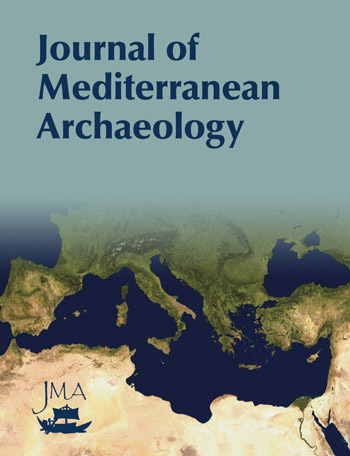 Journal of Mediterranean Archaeology is the only journal currently published that deals with the entire multicultural world of Mediterranean archaeology. The journal publishes material that deals with, amongst others, the social, politicoeconomic and ideological aspects of local or regional production and development, and of social interaction and change in the Mediterranean. We also encourage contributions dealing with contemporary approaches to gender, agency, identity and landscape, and we welcome material that covers both the theoretical implications and methodological assumptions that can be extrapolated from the relevant archaeological data. Manuscripts submitted for consideration should place equal emphasis on data and theory; preference is given to problem-oriented studies that demonstrate a sound methodological or theoretical framework. In terms of its temporal scope, JMA welcomes manuscripts from any period of Mediterranean prehistory and history, from the Palaeolithic to the Early Modern. The geographical focus of JMA is the islands within, and the lands or regions that border the Mediterranean Sea, from Gibraltar and the Iberian Peninsula in the west, to the Jordan Valley and Egypt in the east; from the mountain chains that fringe the diverse coastal plains of northern Mediterranean to the Atlas Mountains of the Maghreb and the Saharan desert cultures that impact on the Mediterranean's southern shores. Please note, the journal does not publish reviews.